We stayed at Jasper County's Mariposa Lake campground, August 10-12, 2012. It was a beautiful camping weekend and we really enjoyed this little campground. The campground is on the north end of a cute little fishing lake. There are two areas to the campground. The north part of the campground loop has several areas for camping, drinking water and a pit toilet. The south part of the campground is closest to the lake and can only be used for those in tents since it was a walk-in area. The north part of the loop was a little more open from the trees and foliage affording you a great view of the stars where-as the south part was more tree-covered. The park has playground equipment, a butterfly garden and a picnic shelter. We had fun walking through the garden and playing on the playground. The lake is for fishing from the shore only (no boats) and had a cute little island in the middle along with a hiking trail around it. 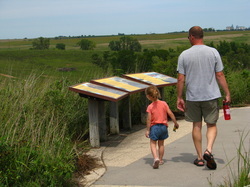 There is another section of the park towards the west which is a prairie area with a few bison. Not far from Mariposa Park is Rock Creek State Park which contains a rather large no-wake lake (great for kayaking). For biking, there are several paved bike trails in the area which are a delight to pedal. A little further away from Mariposa Park lies the Neal Smith Wildlife Refuge, another fantastic place to visit. We arrived on Friday evening, set up camp, made a fire for s'mores and then watched the stars come out. It was perfect as we were the only ones in the north part of the loop! In the middle of the night we were awakened by the sounds of coyotes not far from our tent. My big, strong and very brave husband clapped his hands a few times and they didn't return. We played at the Neal Smith Wildlife Refuge for a better part of the day on Saturday and upon returning to camp found that another couple had set up their pop-up camper in the site next to us. We eventually befriended them and discovered they like to camp for the same reasons we do: quiet and solitude! Even though they were next to us (because it was the second best spot), there was still plenty of space between our two camps. Besides being a fun little park to explore, the other thing that we really appreciated about our Mariposa adventure was the frequency with which the park ranger checked up on us campers. We saw him once Friday night and then at least twice on Saturday. We appreciate parks that employ people that committed to creating a safe and enjoyable camping experience for all. Bottom line: this is a park that we will definitely visit again! I'm a former Spanish teacher so I have been teaching my daughter Spanish since she was a baby. One of the words she knows and uses routinely in place of English is 'mariposa'. Mariposa [pronounced mah-ree-poh-sah] means butterfly. When we found this tiny blue dot on the Iowa state map called Mariposa Lake, we just knew we had to visit. That is how we found this little park and campground!